The American chevron is not a new idea. For thousands of years, the military, ecclesiastical and civil authorities have used some outward symbol to identify rank and function in society. In the U.S. military, non-commissioned officer rank insignia evolved over the past 150 years from a mishmash of epaulets, sashes, cockades, and stripes to today's limited set of stylized and standardized chevrons. Prior to 1872, documentation standards were almost nonexistent. A general order from the War Department dated March 27, 1821, documented the first firm reference to U.S. soldiers wearing chevrons. Today, the chevron represents a pay grade, not a specific trade. Originally, officers also wore chevrons, but this practice began to phase out in 1829. Despite this 10-year use of chevrons by officers, most people think only of enlisted grades when chevrons are mentioned. The direction a chevron points alternated through the years. Originally, they pointed down, and on some uniforms, covered almost the entire width of the arm. In 1847, the point reversed to an "up" position, which lasted until 1851. Service chevrons, commonly called "hash marks" or "service stripes," were established by George Washington to show completion of three years service. After the American Revolution, they fell into disuse and it wasn't until 1832 before the idea was reinstituted. They have been authorized in one form or another ever since. U.S. Air Force chevrons trace their evolution from 1864 when the Secretary of War approve a request from Maj. William Nicodemus, the Army's chief signal officer, for a distinctive signal rank insignia 10 years later. The names Signal Service and Signal Corps were used interchangeably during 1864-1891. In 1889, a simple sergeant's chevron cost 86 cents and a corporal's was 68 cents. The official lineage of today's Air Force began Aug. 1, 1907, when the U.S. Army Signal Corps formed an Aeronautical Division. The unit was upgraded to an Aviation Section by 1914, and in 1918, the War Department separated the Aviation Section (air service) from the Signal Corps, making it a distinctive branch of service. With the creation of the Army Air Service, their device became the winged propeller. In 1926, the branch became the Army Air Corps, still retaining the winged propeller design in its chevron. Distinctive chevrons became cumbersome. Specific designs often depicted a trade skill and each branch required individual colors. For example, in 1919, the Medical Department had seven different chevrons that no other branch used. In 1903, a sergeant might have worn four different chevrons, depending upon which uniform he wore. The overwhelming problems of pay, grade, titles, and allowances caused Congress in 1920 to consolidate all ranks into seven pay grades. This broke the historic practice of authorizing each and every position and listing the pay for each job throughout the Army. The change drastically affected chevron design. Stopping the use of branch and specialty chevrons died hard despite the official War Department policy. Private manufacturers made old specialty designs with the new blue background prescribed for the new chevrons. Unauthorized chevrons were common and these improvised sleeve insignia were even sold in some post exchanges. Throughout the 1920s and 1930s, the War Department fought a losing battle against the specialty chevrons. The most prevalent of the unauthorized specialty chevrons were those worn by Army Air Corps members, with the winged propeller. The Air Force won its independence Sept. 18, 1947, as a full partner with the Army and the Navy when the National Security Act of 1947 became law. There was a time of transition following the new status gave the Air Force. The chevrons retained the "Army look." Enlisted personnel were still "soldiers" until 1950 when they became "airmen" to distinguish them from "soldiers" or "sailors." 9 March 1948 - There is no documented official rationale for the design of the present USAF enlisted chevrons, except the minutes of a meeting held at the Pentagon on 9 March 1948, chaired by General Hoyt S. Vandenberg, Air Force Chief of Staff. These minutes reveal that chevron designs were sampled at Bolling Air Force Base and the style used today was selected by 55% of 150 airmen polled. General Vandenberg, therefore, approved the choice of the enlisted majority. Whoever designed the stripes might have been trying to combine the shoulder patch worn by members of the Army Air Force (AAF) during World War II and the insignia used on aircraft. The patch featured wings with a pierced star in the center while the aircraft insignia was a star with two bars. The stripes might be the bars from the aircraft insignia slanted gracefully upward to suggest wings. The silver-gray color contrasts with the blue uniform and might suggest clouds against blue sky. At this time the size of the new chevrons are determined to be four inches wide for men, three-- inches--for-women-.--- This difference in size created the official term of "WAF (Women in the Air Force) chevrons" in reference to the three-inch stripes. The rank titles, at this time, from bottom to top, were: Private (no stripe), Private First Class (one stripe), Corporal (two stripes), Sergeant (three stripes), Staff Sergeant (four stripes), Technical Sergeant (five stripes), Master Sergeant (six stripes and tithe only rank approved for First Sergeant Duties). 20 FEBRUARY 1950 - General Vandenberg directed that from this day forth, enlisted personnel of the Air Force will be called "Airmen" to distinguish them from "Soldiers" and "Sailors." Formerly, Air Force enlisted personnel were still called "Soldiers. 24 April 1952 - Studies made in 1950 and 1951 proposed to change the enlisted grade structure and was adopted by the Air Council and Chief of Staff in March 1952. The change was embodied in Air Force Regulation 39-36 on 24 April 1952. The primary objective desired in changing the airman grade structure was the restriction of non-commissioned officer status to a group of higher grade airmen sufficiently small in number to permit them to function as non-commissioned officers. Plans for improving the quality of non-commissioned officer leadership hinged upon this change: now that the change was made, plans for investigating and improving the quality of this leadership began. The titles of the ranks changed (although not the chevrons). 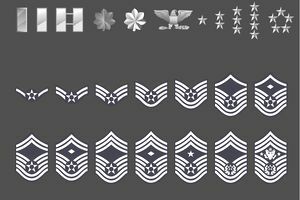 The new titles, from bottom to top, were: Basic Airman (no stripe), Airman Third Class (one stripe), Airman Second Class (two stripes), Airman First Class (three stripes), Staff Sergeant (four stripes), Technical Sergent (five Stripes) and Master Sergeant (six stripes). At that time, it was planned to develop new insignia for the three classes of Airmen (First, Second, and Third). Preliminary sketches of proposed insignia have the stripes at a horizontal level, reserving the angled stripes for the top three ranks to differentiate Non-Commissioned Officers (NCOs). DECEMBER - 1952 - The proposed-new-chevrons for the three lower ---- airman grades are approved by General Vandenberg. However, the procurement action is deferred until existing stocks of the current chevrons are depleted. This is not expected to occur until June 1955. 22 SEPTEMBER 1954 - On this day the new Chief of Staff, General Nathan F. Twining, approves a new distinctive insignia for First Sergeants. It consists of a traditional diamond sewn in the "V" above the grade chevron. Recommendations for the adoption of this distinctive insignia were advanced by two commands: Strategic Air Command (SAC) and Air Training Command (ATC). The suggestion from ATC was included in an appendix buried in a February 1954 ATC Personnel Planning Project, while the SAC NCO Academy, March AFB, CA, proposed the design on 30 April 1954 to the Air Council. 21 SEPTEMBER 1955 - The availability of the distinctive First Sergeant insignia is announced. 12 March 1956 - In 1952 General Vandenberg approved a new chevron for Airman, First, Second and Third Classes. The purpose of this change was to increase the prestige of the Staff, Technical, and Master Sergeant chevrons. The stripes were to change from the angled design to horizontal. However, due to the supply of chevrons on hand, the action was delayed until supply had been deleted, which happened in early 1956. The decision to change the design was resubmitted to General Twining on 12 March 1956. The Chief replied in a short informal memo stating "No change to be made in insignia." JANUARY - JUNE 1958 - The Military Pay Act of 1958 (Public Law 85- 422), authorized the additional grade of E-8 and E-9. No promotions to the new grades were made during Fiscal Year 1958 (July 1957 through June 1958). However, 2,000 individuals were expected to be promoted to the grade of E-8 during Fiscal Year 1959. On the other hand, in accordance with Department of Defense instructions, no promotions to grade E-9 were to be made in the Fiscal Year 1959. During May and June 1958, almost 45,000 Master Sergeants from all commands were tested with the Supervisory Examination as a first step in the final selection of 2,000 for eventual promotion to E-8. This test screened out approximately 15,000 applicants, permitting approximately 30,000 to be further screened- by command boards from which 2,000 would be selected initially. JULY-DECEMBER 1958 - The two new grades (E-8 and E-9) were particularly welcome in that they would relieve the "compression" in the grade of Master Sergeant. However, because the numbers had to come out of the former Master Sergeant authorization, no improvement in promotion opportunity resulted in the overall enlisted structure. It was, nevertheless, an excellent solution to the problem of differentiation in the levels of responsibility among Master Sergeants. For instance, in the maintenance Table of organization for a tactical fighter squadron, four flight chiefs, two inspectors, and the line chief all held the grade of Master Sergeant. The new grades would allow the top supervisor a grade superior to the others, each of whom had substantial responsibilities of his own. Adding two new grades did present some problems. Most significant was the fact that of the total nine grades, five were to be at the "Sergeant" level. Up to 40% of the total enlisted structure would be in these five grades. For this reason, the older breakout of "Airmen" and "Sergeants" seemed outmoded. It was apparent that, with a nearly 1-to-1 ratio between Airmen and Sergeants, not all Sergeants could be supervisors. It was considered that the time had come to effect some differentiation between the less skilled Airmen, the more skilled at the Staff and Technical Sergeant level, and the supervisory level. The speed with which it was necessary to implement the legislation did not permit a complete review of the enlisted structure. It was, therefore, determined that, for the present, the titles and insignia should blend into the system with the least possible change. The comments of the major commands were solicited, and the titles of Senior Master Sergeant (E-8) and Chief Master Sergeant (E-9) were the most popular. They were considered to be the best in clearly indicating ascending grade and to have the advantage of not reflecting unfavorably on those long-time Master Sergeants who would not be selected for the new grades. Since it had been decided to build on the existing insignia pattern rather than to revise the whole series, the problem of a satisfactory insignia became acute. Numbers of ideas were considered. Some of those discarded were: the use of the Master Sergeant insignia superimposing one and two stars (rejected because of the overlapping of general officer's insignia) and the same with lozenges (rejected out of confusion with the First Sergeant insignia). The choice was finally, and reluctantly, narrowed to a pattern which superimposed on the older Master Sergeant Insignia, one and two additional stripes pointing in the opposite direction (upward) leaving a field of blue between the lower Master Sergeant insignia and the stripes of the new grades. While this did not solve --the--problem--of --"zebra- stripes," the solution was- accompanied with the recommendation that the whole matter of revising the enlisted structure as to titles and insignia be studied. No complaints were voiced over the new rank insignia. 5 FEBRUARY 1959 - On this day the new regulation governing the titles of the various enlisted ranks is released. The only change concerns E-1s. Instead of the title "Basic Airman," the new regulation directs that "Airman Basic" is now the proper title. 15 MAY 1959 - A new edition of Air Force Manual 35-10 is published. It addresses an inequity to the enlisted force. At the time of the creation of the Air Force, formal evening uniforms were considered the provenance of the officer corps. At the time no one seriously believed enlisted personnel would have a need nor a desire for stately uniforms. Soon, however, enlisted people made their needs known and by 1959 the uniform manual caught up with the reality of the situation. While the black formal evening dress uniform was strictly for officers only, the dress white uniform was authorized for optional purchase and wear by all enlisted personnel. For the enlisted men, the insignia of the grade was the regulation size (four inches) with white chevrons on a white background. For the enlisted women, the same held true except the white chevrons were three inches wide. These white chevrons were used until the white dress uniform was discontinued in 1971. 28 FEBRUARY 1961 - A lightweight all tan uniform (shade 505) was approved by the uniform board. However, only three inches "WAF chevrons" were to be worn on the shirt. This necessitated a change of name. Since men were now wearing the "WAF chevrons," the official name of the three inch wide stripes became "small size. 12 JUNE 1961 - A new edition of Air Force Manual 35-10 revealed a new optional uniform for the enlisted ranks: the black Mess Dress Uniform. Previously prohibited from wearing the black formal wear, the new black mess dress brought about the need for chevrons with aluminum metallic on a black background. These embroidered stripes are still in use for the mess dress at the present time. JANUARY 1967 - Creation of the Chief Master Sergeant of the Air Force (CMSAF) with its own distinctive insignia. 22 AUGUST 1967 - On this day the uniform board started to explore methods to affix enlisted rank insignia on the raincoat. This problem will perplex the board until 1974. 19 OCTOBER 1967 - Airman grades, titles, and terms of address were revised.to make the following changes, and to restore NCO status to grade E-4: Airman Basic (no stripes), Airman (one stripe), Airman First Class (two stripes), Sergeant (three stripes), Staff Sergeant through Chief Master Sergeant, and First Sergeants, no change. The change of title for pay grade E-4 from Airman First Class to Sergeant restored the NCO status lost to this grade in 1952 when the Air Force adopted new titles. The elevation of E-4 to NCO status also aligned Air Force grades with the other services and recognition of the level of qualification and performance required of airmen in grade E-4. Airmen could not be promoted to E-4 until qualified at the 5-skill level, exactly the qualification required for promotion to Staff Sergeant. As a side benefit, the prestige gained from restoring NCO status and privileges to the E-4 grade came at a time when airmen were approaching their first reenlistment point. At the time the Air Force was experiencing drastic losses as many did not reenlist. It was thought that achieving NCO 26 status at the end of the first enlistment would aid in retention. 25 NOVEMBER 1969 - The uniform board met on this day and approved the wear of the black background chevrons with aluminum color stripes and star on the white mess jacket and the informal white uniform coat in lieu of the authorized white-on-white chevrons. The white-on-white chevrons were allowed to be worn until 1 January 1971, at which time the black chevrons on those uniforms would be mandatory. The white-on-white stripes had been in use since 1959. 11 AUGUST 1970 - The uniform board directed that enlisted personnel will wear three-inch chevrons on the tan 1505 short sleeve shirts. 4 DECEMBER 1970 - In search of an appropriate chevron for enlisted personnel to wear on their raincoats, the uniform board approved the concept of allowing.a plastic rank insignia to be worn on the collar. In addition, the use of such a plastic chevron was developed for use on the lightweight blue jacket and utility shirt. 21 SEPTEMBER 1971 - After various reactions to the plastic chevrons, the uniform board recommended further field testing, using both plastic and metal collar chevrons on the men's and women's raincoat, lightweight blue jacket, topcoat, utility shirt and organizational white medical uniforms. 23 AUGUST 1974 - General David C. Jones, the USAF Chief of Staff, approved the wear of metal collar chevrons by enlisted personnel on the raincoats, men's optional topcoat, lightweight blue jacket, medical and dental whites and the food handler's coat. This ended a seven-year debate begun in 1967. However, General Jones stressed that the use of traditional sleeve chevrons on other uniforms is maintained to the maximum extent practical. 30 DECEMBER 1975 - The E-2 through E-4 rank chevrons were reviewed in December 1975 during a CORONA TOP meeting which examined a proposed three-tier enlisted force organization. A new criterion for advancement to NCO status was decided and announced to the major commands on 30 December 1975. A key aspect of the new program was a new insignia for Senior Airmen and below. The insignia would sport a blue star instead of a silver star in the center of the chevrons. JANUARY-FEBRUARY 1976 - To institute the change by 1 March 1976, liaison with the Institute of Heraldry and the Army and Air Force Exchange Service began to ensure that the new insignia would be readily available. However, there was difficulty in obtaining the new blue-star chevrons because of normal lead time required by the garment industry to change to the new insignia. On 27 January 1976, the Institute of Heraldry advised the garment industry of the new Air Force requirements, and by 12 February 1976 Army and Air Force Exchange Service (AAFES) Pentagon Liaison office advised the Air Force that the insignia sources would be ready to supply by 1 March as desired. However, late in February, it was obvious that the garment industry could not support the 1 March date. Therefore, major commands were notified by Headquarters Air Force to postpone the implementation of the new rank until 1 June 1976. 1 JUNE 1976 - Because of the difficulty encountered in obtaining the new insignia at all bases throughout the Air Force, Consolidated Base Personnel offices were requested to ensure that Base Clothing Stores and Base Exchanges were taking action to ensure availability of the new insignia to meet requirements at their installation. The situation was complicated by the transfer of responsibility for Military Clothing Sales to the Army and Air Force Exchange Service during this period. The final result was a decision for AAFES to "force-feed" the requirements for each base directly to the Defense Personnel Service Center for the first 90 days following implementation on 1 June 1976.
military Clothing Sales to the Army and Air Force Exchange Service during this period. The final result was a decision for AAFES to "force-feed" the requirements for each base directly to the Defense Personnel Service Center for the first 90 days following implementation on 1 June 1976.